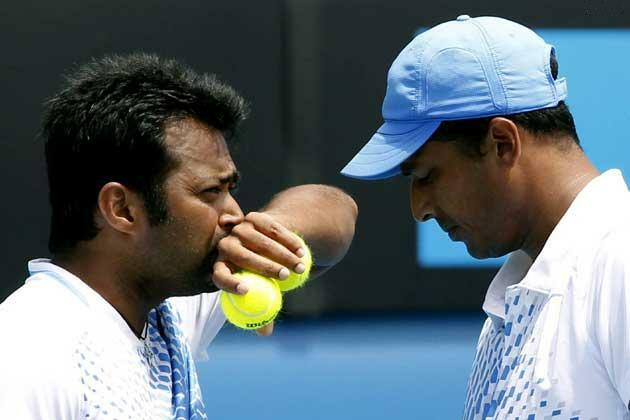 Leander Paes and Mahesh Bhupathi are on course for their maiden Australian Open title together as they advanced to the finals after a hard-fought victory over the combine of Max Mirnyi and Daniel Nestor here on Thursday. The third seeded Indian pair, who teamed up together after nine years in a bid to add the only Grand Slam title missing in their cupboard beat the second seeded combine of Max Mirnyi (Belarus) and Daniel Nestor (Canada) 7-6,4-6,6-3 in a semifinal match at Melbourne Park. The Indian Express got off to a good start registering the first set in their favour but went down fighting in the next set and came back strongly in the third and last set to win the match. They will play against top seed American twins and double defending champions Mike and Bob Bryan in the summit clash. The Bryan brothers eased past unseeded duo of Eric Butorac and Jean-Julien Rojer 6-3, 6-2 in 54 minutes in their semifinal. Paes and Bhupathi decided to rejoin the forces after nine years to win that elusive Australian Open trophy, at the start of the season. They came into Australian Open in a good nick as they clinched the Chennai Open at home. Paes has won 12 Grand Slam titles and Bhupathi 11 in their respective careers but they have never won Australian Open men's doubles trophy. Interestingly, Bhupathi has not won a men's doubles Grand Slam title since 2002 US Open with max Mirnyi. 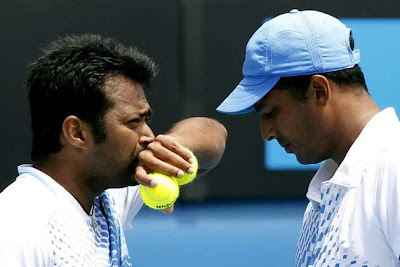 Paes and Bhupathi last played together at a Grand Slam at Australian Open in 2002 when they reached the second round.